Social media does continue to show its positives every now and then. Casually following a link on Facebook, I found myself looking at the 14 Upgate website and wondering why such an interesting, and interestingly close restaurant had not come to my notice before. There are no starred restaurants in northern Lincolnshire but 14 Upgate is in good company and gets a ‘Michelin Plate’. That is the same accolade as ‘Winteringham Fields’ and three other establishments in the 2018 Michelin Guide. Tasting menus only are available here. Four courses are offered on a Wednesday evening and six for the following three nights. Suggestions of a healthy work/life balance there. We booked. On a Wednesday for three people. That was mildly unusual but Mum was staying and we wanted to include her in a paid-for meal which could either be put down to experience or would encourage more visits. Seasoned restaurateur Andrew Leonard is Front of House. In fact he is Front of Everything except the kitchen which is the domain of Michael Bullamore. Andrew guided us upstairs for pre-dinner drinks. The wine list offers ‘usual suspects’ and some interesting alternatives, all at sensible prices. The first tastes of chef’s food came along as canapés. Much more forgiving in texture than meat jerky, the carrot retained its sweetness. Minty yoghurt was a good, mildly sour foil. Fish Nuggets & Our Own Tomato Ketchup. We should all make a version of this in our own kitchens as a crowd-pleasing ‘nibble’. Christmas is imminent as I write and will provide a good excuse for doing just that. Although almost any homemade ketchup is going to satisfy, this Louth recipe was lovely and counted as our first suggestion that chef knows very well what he is about. Downstairs again for our meal. Malted Grain Bread & Butter. The absence of good bread can let the side down. No let-down here. Celeriac & Apple, Pistachios, Louth Cured Pancetta. Warm up the flavours of a Waldorf Salad? Why not if it works this well. Flavour and texture were very satisfying and the warmth of the base elements slowly melted the pancetta fat into something even richer and more indulgent than any cold mayonnaise dressing. 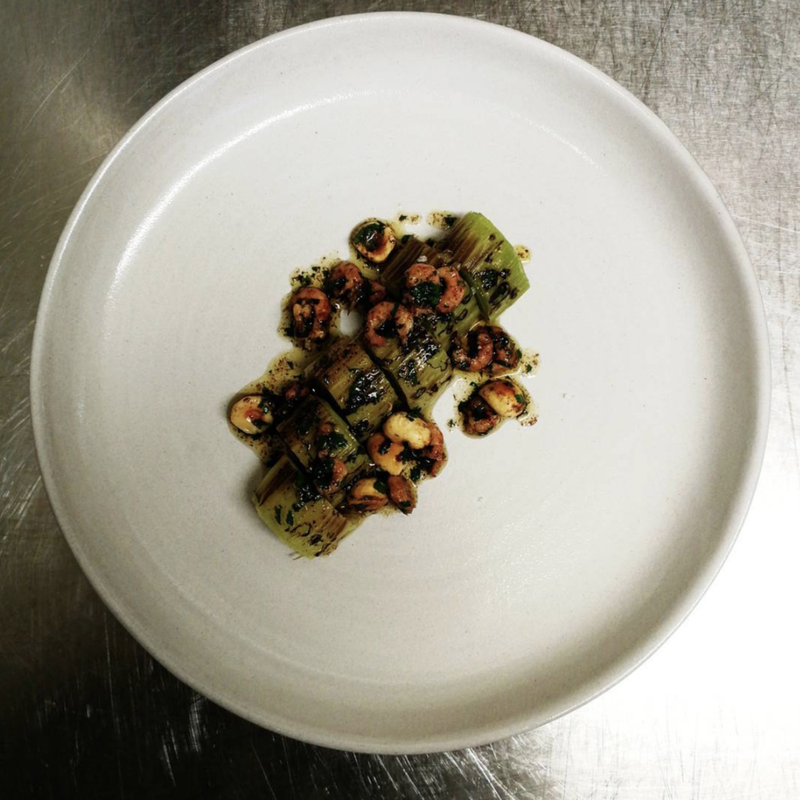 Leeks, Brown Shrimp, Hazelnut & Lemon Butter. At a push you could categorise this as ‘Surf & Turf’. The leek, of course, was a much less intensively farmed product than the usual meat element but animal fats were not needed to provide any more flavour. Again, the ingredients had been understood, valued and combined to give so much more than might have been expected. Sweet leeks were charred just enough to offer a balancing bitterness. Shrimps held on to a suggestion of the sea and lemon was pulled back so as not to overpower anything. If I had to pick a favourite from the evening this was it. Local Beef Skirt, Beetroot & Horseradish. No hiding place with this one. Masquerading as slices of rare sirloin steak and tasting just as good, a cheap cut of meat was given top billing. All achieved by sous-vide cooking and last minute pan searing. The beets were more sweet than earthy and my personal taste wanted an extra hit of horseradish. But the meat was perfectly seasoned and finished and the dish still offered much more satisfaction than you might expect from such a simple plate. Baked 55% Chocolate & Violet Ice Cream. Dessert did not rely on the fancy work of a pastry chef. The simplicity of two elements was enough to bring a smile though. Warm, crumbly, chocolatey, cakey slice contrasted with cold but gentle and rather sophisticated violet. A very successful pairing. The underlying simplicity of each dish means that you can focus on flavours. These are brought out in abundance from just a few elements. Which means that a small plate still holds challenge and interest. We shared the twelve seat dining room with six others on our visit. Even a limited number of covers doesn’t guarantee constant personal attention but Andrew makes a fine job of serving, informing and explaining… and judging the right time to withdraw. He is the perfect foil to Michael’s kitchen magic. If I’ve whetted your appetite this is the time to think seriously about booking. Don’t expect to enjoy all, some or any of the dishes I’ve described. Chef is confident and clever and, importantly, competent enough to react to daily availability of fresh produce. He will change his menu according to markets and seasons. So much better and more interesting than trying to give the customer what they want. And you will want what he is offering. A lovely, short chat with Michael after service revealed that his favourite chef is Simon Rogan. This information gave all the night’s cooking even more clarity. There is no reason, on current evidence, why he shouldn’t develop far enough to garner the starry Michelin accolades of a place like ‘L’Enclume’. After all, chef Rogan was once as good as Michael! This delightful dining opportunity is two years into its existence in Louth. It is a great chance for you to be looked after by two people who understand how to deliver quality and enjoyment through hospitality. This all comes with terrific value for money. I guess if Michael fulfils the promise of his culinary skills, he could well find work further afield. At present, a recent family addition (Congratulations!) might settle him here longer. But we will certainly book again soon just in case. And as long as chef remains we will continue to book. The only bad feeling I have regarding this place is that I didn’t know of it sooner... so thank you Facebook!